Cyclone Gaja is expected to make landfall near Nagapattinam, which could lead to winds blowing at speeds 80-90 kmph, gusting to 100kmph. The cyclonic storm Gaja has intensified and is expected to make landfall today between Cuddalore and Pamban close to Nagapattinam on Thursday evening or night, according to the Met Department. On Thursday evening, the India Meteorological Department (IMD) reported that Cyclone Gaja is about 260 km southeast of Chennai and 180 km east-northeast of Nagapattinam, in Tamil Nadu. "It is very likely to move west-southwestwards and cross Tamil Nadu coast between Pamban and Cuddalore, around Nagapattinam during late evening of today, the 15th November, 2018 as a Cyclonic Storm with a wind speed of 80-90 kmph gusting to 100 kmph," IMD said in its bulletin. There was no significant rainfall so far on Thursday in most of the vulnerable districts, while Chennai witnessed sporadic spells of rain. The met department has warned of heavy to very heavy rainfall at a few places over Tamilnadu and Puducherry on Thursday due to cyclone Gaja. The cyclonic storm is expected to cause extremely heavy rainfall exceeding 20 cm at Cuddalore, Nagapattinam, Karaikal, Tiruvarur, Thanjavur, Pudukkottai, Tuticorin and Ramanathapuram districts, according to the IMD. The IMD has also predicted rough sea conditions along and off the coasts around Tamil Nadu, Puducherry and southern Andhra Pradesh. On account of this, the IMD has called for total suspension of fishing activities in these regions for the past 24 hours. 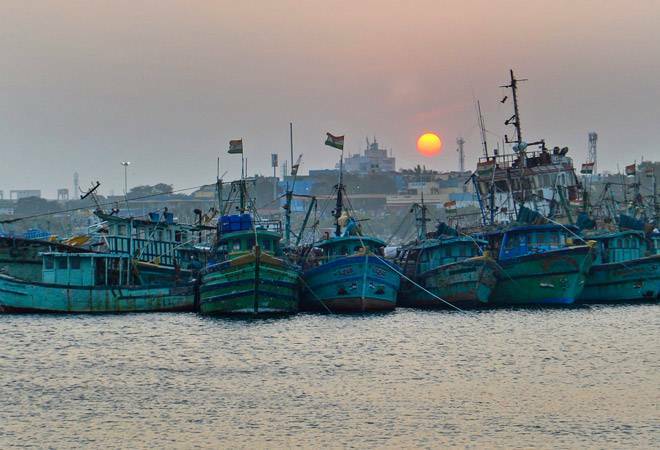 Fishermen have also been advised to stay away from southwest and adjoining west-central Bay of Bengal during next 24 hours. With wind speeds reaching 100 kmph, hutments and thatched houses along the coastal lines are expected to be damaged by Cyclone Gaja. With this in mind, hutment dwellers in Nagapattinam have been evacuated to safer places, whereas other in the would-be affected areas have been advised to remain indoors. The IMD has also issued warnings about a storm surge of height of about one meter above astronomical tide. As Cyclone Gaja makes landfall, the low lying areas of Nagapattinam, Thanjavur, Pudukkottai and Ramanathapuram districts of Tamil Nadu and Karaikal district of Puducherry are expected to be inundated. Loss of property is also expected in these areas. Meanwhile, schools and colleges will remain shut in the Thanjavur, Thiruvarur and Pudukottai districts in Tamil Nadu on Friday. The Tamil Nadu government has announced helpline numbers 1070 (state-level) and 1077 (districts) for those who may need assistance, a PTI report said. Meanwhile, rescue forces and Indian Navy has been put on alert to deal with any untoward incident.